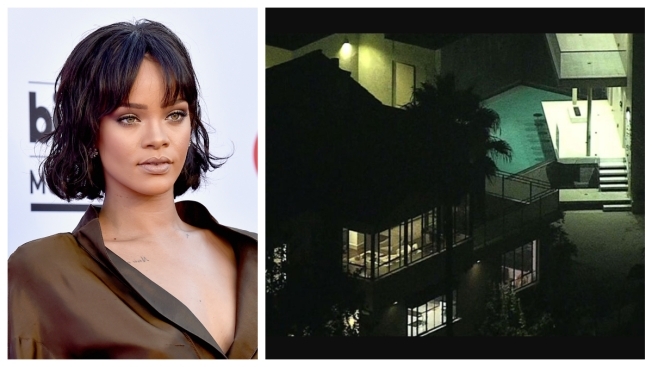 A Hollywood Hills home owned by singer Rihanna was broken into Tuesday night, police said. Los Angeles police officers were called to investigate a residential burglary at the home in the 7800 block of Hillside Avenue. This is the second time that Rihanna, whose real name is Robyn Fenty, is victim of burglary. Earlier this year, her home was burglarized during the month of May. LAPD confirmed that property was stolen from the residence Tuesday night, but nobody was at home at the time of the burglary. When Newschopper4 Bravo arrived over the scene at approximately 10:30 p.m., the home's burglary alarm system could be seen flashing with police congregating outside the home. LAPD said the singer's sophisticated security system alerted them of the incident and they responded to a call at 9:35 p.m.
Police confirmed they have evidence of the suspect or suspects of the burglary and have identified a vehicle, but the investigation continues.